Blogger friends, get excited! 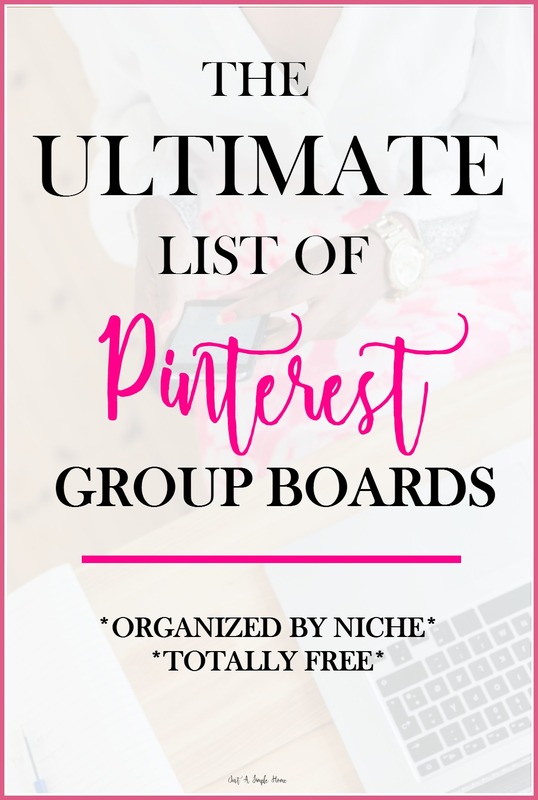 I have compiled a huge list of Pinterest group boards for you…organized by niche! 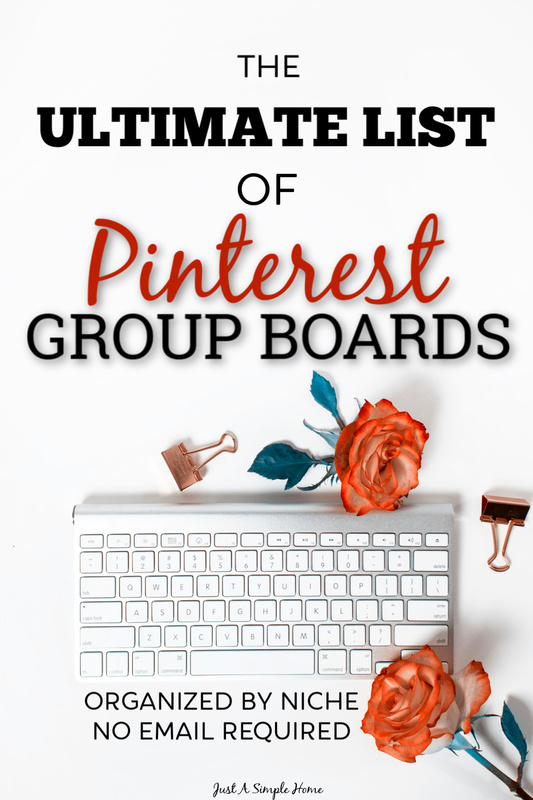 I know Pinterest is a huge source of traffic for us and group boards are instrumental to that. I hope you can find a few boards to join that suit your needs. Please know that each board has its’ own set of rules you need to abide by. Some board owners want you to email them, some want you to comment on a pin, some will send you an invite when you follow the board. Please read the board rules! When you join a board, be a responsible pinner and stay respectful to the rules. Running a group board can be a huge undertaking and you do not want to be asked to leave. One thing to note: please be patient when asking to join a group board. Group board owners often get hundreds of emails a week, and this is usually in addition to any normal business tasks they have. It does get overwhelming! I know I only approve pinners about once a month. Also, if I receive an email from someone who doesn’t follow directions, like adding their link or telling me which bard they are requesting, I will often delete right away. This is not to be mean, it’s just that our time is valuable! So, pay attention and give grace. I will continue to update this list as my time allows and as I find more amazing group boards. Happy Pinning! Family, Fun, Food & Frugality! The BEST Recipes on Pinterest! Fitness Motivation. Healthy Recipes. Workouts. Infographics. This is a great resource! Thank you for sharing! You are so welcome, Ana! You are such an angel! Thank you for creating this amazing resource!!! Thanks Terryn! You saved me a lot of time!! Especially when it’s a bit harder to find group boards now. Thank you for sharing this Terryn! I’ve been thinking of testing Pinterest group boards out for my business. Thanks for putting this list together, super helpful! I just signed up for “Blogging with heart community”… how do I find you ladies. I just signed up for “Blogging with heart community”… how do I find you ladies? Do you happen to know of any other that might be taking in bloggers? Hey Nataly! The group is a “closed” group…meaning it isn’t open to the public, you have to request to join. Go ahead and request it and I will add you in! Oh Terryn, you read my mind, this is just what i was looking for. I’m going to share this one.. Cheers Jacinta. Thank you for putting this together! It’s perfect! Thank you so much for putting this list together. I’m a month into blogging and have been looking for groups to join. Thank you for sharing this comprehensive list with us. I have dabbled with a couple of small blogs, but never had a need to grow my audience. I am now reaching out to Blogdom with my business goals in mind. Thanks bunches! Thank you for this list! New to blogging and trying to grow my Pinterest!! Great resource, Terryn. Thank you! You are very welcome, hope it helps! This is the best list I have seen yet. Thanks for sharing. Hello – great list. Would you like to add our travel group board to your list? Hello, Terryn! Thank you so much for this list. I’ve just started a blog and am looking for some ways to get some traffic to my site, and read that it’s helpful to be part of some Pinterest group boards. Book marked the page! It is very helpful. Thanks again! Wow, this information is gold! The time and effort it took for you to put it together and shared with us is very much appreciated! Thank you so much for posting this ! Ive just launched my blog Mammamode.com and I’ve been searching for the right boards to join . Thanks for supporting us new bloggers! I’d love for more people to join! You are so welcome Kelli! Hi Terryn, this blogpost is amazing. Thank you for taking the time to create such detailed content. What an amazing list!! Thanks for sharing. I’ve made a group board for Creatives, digital Shop owners, designers, and creative bloggers. Wonderful resource, thanks so much! Are there any disability groups? Any idea? Thanks for posting such a useful resource. I pinned it. Hey Terryn! We have our own group board in a niche that you don’t have listed! We wanted to share that with you in case you wanted to add it to your list! This group is for dog bloggers like myself! What an amazing list! Thanks for putting this together! This list must have taken so much time to build. I really appreciate that you have made this available to Pinterest members. I will definitely be using it to join other groups boards. Thank you. Thank you so much for sharing this amazing list. So useful. Wow 🙂 this blog post is super useful! Thank you very much! Wow you have gone to a lot of in depth research in this post that’s fantastic. Thanks I am going to check them out. Wow, I know book bloggers a small niche, but really, no list for us? I guess I might have to start a book group. Great post, with great content. I added to some of them as I was looking for new boards to join. Hi dear ,How to join? This was so helpful Terryn, thank you!! I love this! I just paid for tailwind so I’m going to be using a lot of Pinterest and joining group boards is so beneficial. Thank you! Thanks so much for putting this awesome list of pinterest group boards together! Can’t wait to check a few of these out. Thankew so much for sharing such a piece of nice information about the Pinterest board I really like your blog keep sharing this type of information thanks.